Global solar photovoltaic capacity has grown from around five gigawatts in 2005 to a approximately 306.5 gigawatts in 2016. In that year, cumulative solar PV installations reached some 41.3 gigawatts in Germany alone. By 2016, the residential solar PV market in the United States is projected to be worth around 4.7 billion U.S. dollars. Solar energy technologies remain one of the most heavily funded renewable source. The capacity of newly installed solar PV has continued to steadily grow over the last decades, with China being one of the largest market for solar cells and modules. China was home to seven of the world’s ten leading solar module manufacturers in 2015. The country’s share of the global installed photovoltaic capacity reached 25.5 percent in recent years. At this time, solar PV capacity only accounted for about one percent of the country’s energy output. However, China continues to place a larger focus towards moving to clean energy sources and is expected to continue adding solar capacity. Since the industry’s beginnings in the country, China has moved from a small, rural-oriented solar program to one of the largest markets in the world. The market may have largely emerged in the late 1990s when demand for solar panels in Germany began to rise. Despite its quick rise globally, the number of solar installations in China has decreased largely due to a reduction in feed-in tariffs. The cost of solar PV modules continues to decrease in international markets. Thus, weaker demand and prices may put heavy pressure on some solar companies. 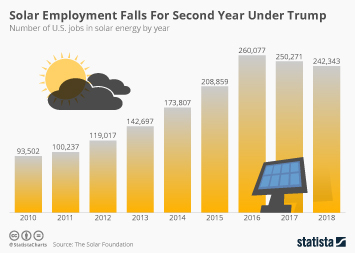 The election of Donald Trump will likely alter the regulatory environment of the solar energy industry which may cause repercussions across the world.